North Korea’s Foreign Ministry vowed to make further efforts to normalize ties with members of the international community on Thursday, as the rogue nation’s diplomatic isolation continues. “The DPRK will continue to actively develop the relations of friendship and cooperation with many countries in the world in accordance with the ideals of foreign policy of independence, peace and friendship,” a statement posted in English on the official website of the North’s Foreign Ministry said. DPRK is short for North Korea‘s official name, the Democratic People’s Republic of Korea. 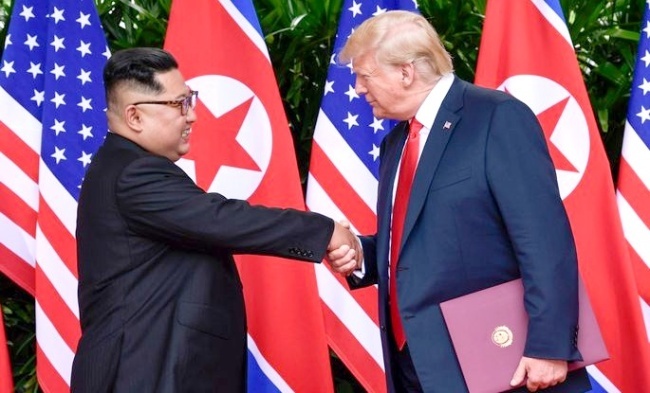 Through denuclearization talks, North Korea has been seeking to normalize bilateral ties with the US and normalize trade ties with other countries while it struggles with international sanctions that aim to isolate the North diplomatically and economically. Earlier this year, North Korean leader Kim Jong-un vowed to focus on economic prosperity, announcing the completion of his signature “byungjin policy,” which is parallel development of nuclear weapons and economy. But with the current stalemate in the denuclearization talks, North Korea has yet to make any noteworthy progress in breaking out of its isolation. “Placing our country’s dignity and interests before anything else, we will actively develop external relations in a diversified way, and promote many-sided exchanges and cooperation with the capitalist countries, too,” the statement read. The ministry also highlighted ties with China, mentioning Kim’s “recent three rounds of visits” to the neighboring communist nation. Kim’s interactions with his Chinese counterpart Xi Jinping since the beginning of the year was a sign that diplomatic relations between the two countries has moved up a notch, but US President Donald Trump’s recent accusation that China is stalling the denuclearization efforts has presented obstacles for the neighbors. Instead of Xi, Li Zhanshu, Xi’s top aide, is to join the founding day celebrations, which observers said was a move to evade further friction with Washington. US and China have engaged in an escalating trade war for months by slapping tariffs on each other‘s products.